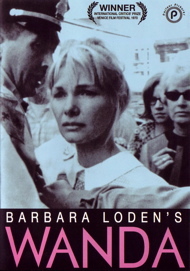 Independent film festivals got a boost in 1970 with Barbara Loden's Wanda, a resolutely dour road movie that confronts American optimism with a vision of despair and worthlessness. At one point, the bitter and drunken Mr. Dennis tells Wanda that the important thing in life is to go after what one wants, otherwise "You're nothing." "Then I guess I'm nothing," says Wanda, without a bit of irony. The grainy photography and catch-as-catch-can audio make Wanda a demanding viewing experience, but it's memorable and rewarding nonetheless. Ms. Loden went on record as wanting to counteract the Hollywood vision that drifting on the road involved in crime is a liberating lifestyle. We want to reach out to Wanda but honestly doubt whether anything could break her self-imposed cycle of misery. Deadbeat mom Wanda (Barbara Loden) cannot raise the will to take care of her children or her house in the coal fields, and allows a judge to grant her husband (Jerome Thier) a divorce and full custody. Wanda drifts on the road, sleeping with any man that picks her up or buys her a meal. Her purse robbed in an all-night movie theater, she meets thief Mr. Dennis (Michael Higgins) in a bar but is too distracted to notice that he's robbing the place. Wanda accompanies the perpetually angry and abusive Mr. Dennis as he drinks himself to sleep and pulls off small robberies and car thefts. After visiting his aged father, and finally expressing some bona fide human emotions, Mr. Dennis prepares Wanda to help him with a complicated kidnap-bank robbery scheme. After a feeble resistance Wanda is takes her place as Mr. Dennis' accomplice. Director Elia Kazan met Barbara Loden in the late 50s, impressed by her talent and independence. He cast her in a small but amusing role as a Tennessee secretary in his wonderful Wild River: when TVA agent Montgomery Clift asks for advice on how to remove a stubborn old woman from an island about to be flooded, Loden's character looks him in the eye and says, "I'd let her drown." Kazan gave Barbara a much larger part as Warren Beatty's promiscuous, shocking sister in Splendor in the Grass, and she was marvelous. But she didn't continue with larger screen roles. Although critics always cite the Kazan connection, Loden put together Wanda on her own with a major technical assist from filmmaker Nicholas T. Proferes. It was her concept and her direction. She also found the main investor. Wanda is an absorbing character study that leaves us empathizing with a woman we know little about. From a feminist standpoint the pitiful Wanda is a worst-case scenario. Basically attractive, she has lost all pride in her appearance and behavior. Bored to the point of brainlessness by marriage to a coal miner, she arrives late at her own divorce hearing, unable to work up the will to care about anything. Wanda's husband complains that she does nothing and won't take care of the kids. She passively states that they'd be better off with him anyway. The judge simply cuts Wanda loose. As far as the male-dominated authorities care, she's an abject failure. Proferes' camera uses long takes of Wanda walking on a coal road and sitting in bars. She acts indifferent but clearly retains a desire to be wanted. She's an easy pickup for a traveling salesman who later ditches her without a word at an ice cream stand. Men take her to bed but don't want to talk to her. She drifts into a Spanish-language movie theater (with a poster for El Barón del terror outside), falls asleep and wakes to find her few dollars stolen. With just the clothes on her back Wanda barges into a tavern after hours, insisting on using the ladies' room. That's where Wanda meets the sociopath Mr. Dennis, an "ordinary looking guy" who smokes cigars, drinks too much and treats even worse than the others. He doesn't understand Wanda's passivity and her tendency to hang on to loose men like a lost dog. Wanda accepts his verbal abuse silently and even weathers a few drunken slaps. She doesn't realize it at first, but Mr. Dennis is a wandering bandit who steals cars and holds up liquor stores. He steals clothes out of other peoples' cars, sorting out what he wants to keep at a Goodwill donation box. Wanda and Mr. Dennis barely connect as human beings yet make a fascinating, fatal pair. She accepts him without question and he presumes she'll go along with whatever he says. The most startling scene comes when Mr. Dennis visits his father, who refuses to accept his money and seems to know that he's a loser heading for more trouble. Mr. Dennis tries his best to put on a false front, but it does no good. That "old folks" meeting and the extended bank robbery caper that follows give Wanda more similarities to Bonnie & Clyde. The entire sequence is handled in vérité fashion, as was a particularly effective hand-held scene of Mr. Dennis checking door locks in search of a car to steal. Loden pauses for a few conventional narrative effects as Mr. Dennis and Wanda case the bank and invade the house of its manager (Jack Ford). Loser that he is, Mr. Dennis allows the manager to overpower him and Wanda saves the day by recovering his gun. As they prepare to go get their money from the bank Mr. Dennis tells Wanda that she "did good," his only words of praise in the film. Wanda responds with a broad smile. It's chilling to think that life can be that grim. Of course, from this high point Mr. Dennis' flimsy caper goes completely downhill. Wanda holds our attention because of the interesting characters and Loden's intimate direction. We watch Wanda with a mixture of dread and fascination, straining to detect a social indictment or indication that she's meant to be a feminist martyr or some kind of symbol. That Loden doesn't burden Wanda with any such agenda makes her seem all the more real for it. She may be the homeless person on skid row, the one asking for money with genuine desperation, even if her story is an obvious lie. Wanda is only a couple of steps below the level of the women in the documentary It Was a Wonderful Life; she lacks their fortitude and sense of self-worth. Critics lauded Wanda when it was shown at film festivals but it never received a real release. Barbara Loden did not make another film although she planned others right up to her death from cancer ten years later. Being the wife of the famous Elia Kazan reportedly turned out to be a liability. Kazan neither supported nor encouraged Loden, yet many people assumed that her career was his doing. Parlour Pictures' DVD of Wanda is a satisfactory transfer of a true landmark independent film. It was blown-up from 16mm and was always extremely grainy in some scenes. The audio track is often difficult to hear, as the sparse dialogue probably wasn't that well recorded originally. Menus and packaging are handsome. A lengthy liner essay is included by Loden expert Berenice Reynaud. Loden's story makes for good reading. Savant was surprised to learn that actor Michael Higgins is the same talent from the Horton Foote film trilogy Courtship, On Valentine's Day and 1918, where he plays the elder, stern father character. Higgins is terrific here, chomping his cigar and drowning his anxiety in alcohol. Apparently when Loden was filming in a field off a Pennsylvania highway, she was interrupted by some people flying a model airplane. Loden and Higgins turned the plane to their advantage by having the drunken Mr. Dennis climb on top of his car to shout at it. It's a piece of improvisation worthy of John Cassavetes. Supplements: Insert with essay by Berenice Reynaud.